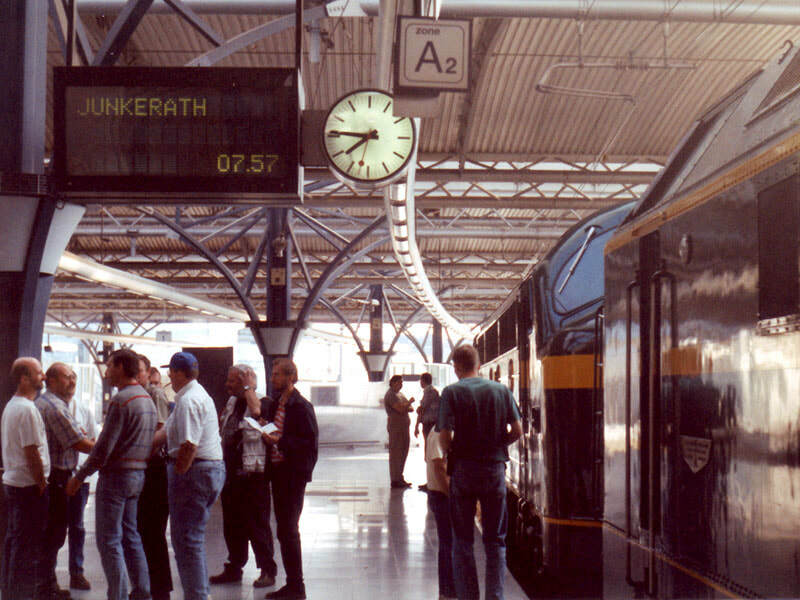 It could be any UK pre-railtour gaggle In fact we're at Brussel Zuid/Bruxelles Midi before the PFT tour on 26.6.99 - note the destination indicator! 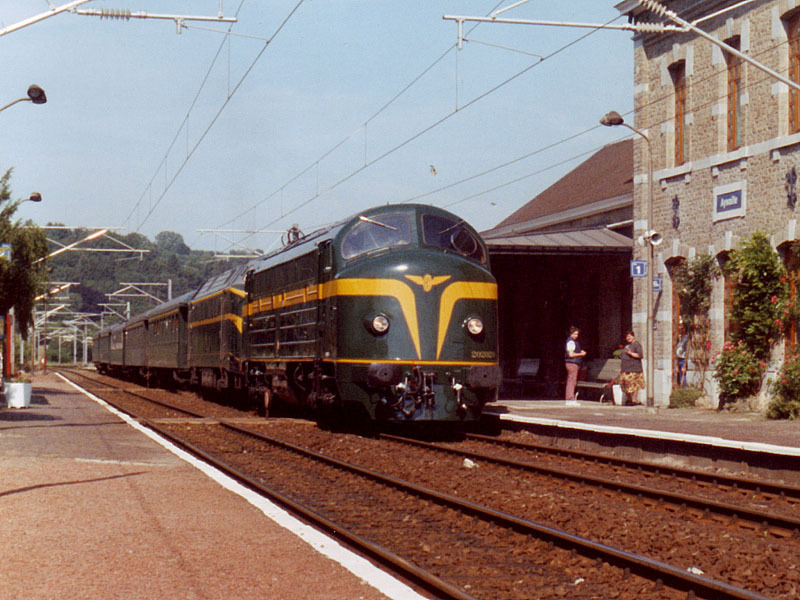 PFT's immaculate diesels, 202020 and 210077 are on the right. This was a somewhat extended weekend visit whose main purpose was to do the last un-bashed (by me) part of the Vennbahn, the long stretch from Weywertz in Belgium over the border to Jünkerath on the Köln-Trier line. I added on a couple of days to do one or two more oddments. A truly awful hotel (to spare its blushes I'll just say 'never again'), but redeemed by being very near to Au Laboreur [no longer a pub, sadly] where Westmalle Tripel is BEF90 and flies are free of charge… Midi had absolutely no knowledge of tomorrow’s PFT tour but this is par for the course in Belgium and no cause for concern. Two other Brits encountered in the Laboreur were in the same position. Memo for the future : Maredsous 10° is exceptionally serious tackle. Quite a good night’s kip in the Hotel Unmentionable despite the attentions of local mosquitoes. The anaesthetic effect of Westmalle Tripel and Maredsous 10° must have been relevant. Midi had woken up when I got there at 0725 and was advising departure of 0757 to Jünkerath from P6. After a cup of coffee, both train (immaculate 202020 and 210077 and some nice old stock) and organisers (very affable, pile in and we’ll sort it out later) were located. [I’d been in contact with the organisers but hadn’t booked, due to the complexity and expense of getting a grasping British bank to pay anybody abroad]. Locos and departure indicator were photted, bar located (Duvel BEF 60) and a seat found. Departure at 0756! Memo : don’t push the time for a PFT tour… Thalys 4331 turned up on P5, impressive as usual. The tour train slowed before Centraal then charged through with both locos flat out. Possibly deliberate [it was. I later found out this is a PFT trademark], certainly normals on the platform at Centraal were observed covering their ears. A stop was made to pick up a few more cranks at Noord. The airport appears still to be on the same alignment where it joins the main line so there is no need to revisit to do the down curve (which is currently disconnected for large scale engineering work). If I’d known the tour picked up at Leuven I’d have stayed at the Industrie. Still, I enjoyed the Maredsous. 15 minutes late at Liège was converted to right time by omitting two photo stops, but the one at Aywaille was taken, with 10 late departure in consequence. I had forgotten the near-riot conditions which can prevail at Belgian photo stops – very entertaining. Left : Belgian photo stops might be a bit riotous while they sort themselves out - but in the end you get a clear, muppet-free shot. Nobody but me to blame for this one! 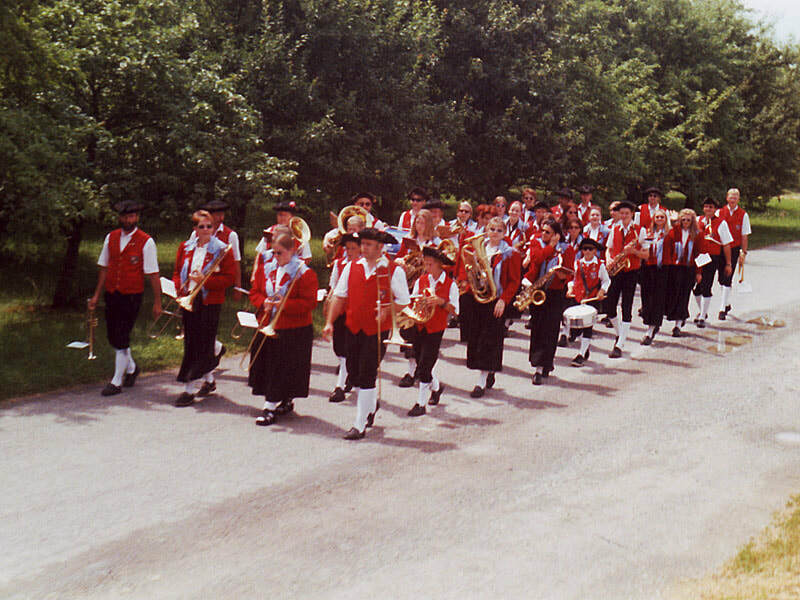 The PFT tour is standing at Aywaille on 26.6.99. 202020 picks its way through the weeds at Junkerath on its way back to Belgium. 26.6.99. Half way to Liège, Mr. Intelligent had realised that he had no idea whether Jünkerath was big enough to support a cash machine, no idea if DB booking offices took credit cards, no idea whether there was such an office, and no idea whether DB conductors took credit cards. Being in possession of some DM18 this caused some concern until an alternative strategy was evolved, to use the Eurodomino today and a Wochenendticket tomorrow. The next problem was timekeeping which was so erratic that at one point arrival in Jünkerath after the 1648 to Trier seemed possible. After being 35 minutes down at one stage, arrival at Jünkerath was 20 early in the end! The booking office was closed but a friendly local directed me the 300m or so to a cash machine and all was well. The station buffet was open – Gaffel Kölsch was OK, and about £1.85/pint. Several were consumed, in company with 3 British haulage bashers also en route to Trier. The 1645 to Trier was 215-hauled, the haulage bashers insisting on the front (ex DB main line) coach to listen to the very quiet 215. At Trier an 8 minute connection was on offer for the 110-hauled 1819 to Bullay, the junction for Traben-Trarbach. This was a complete surprise – Bullay is on the south bank of the Mosel/le (line crosses just west of Bullay) and TT is on the north bank, but closer to the river and lower than the main line. Physical connection is beyond the bridge and the first tunnel, so no problem with the ‘bay’ (in fact another island) platform. 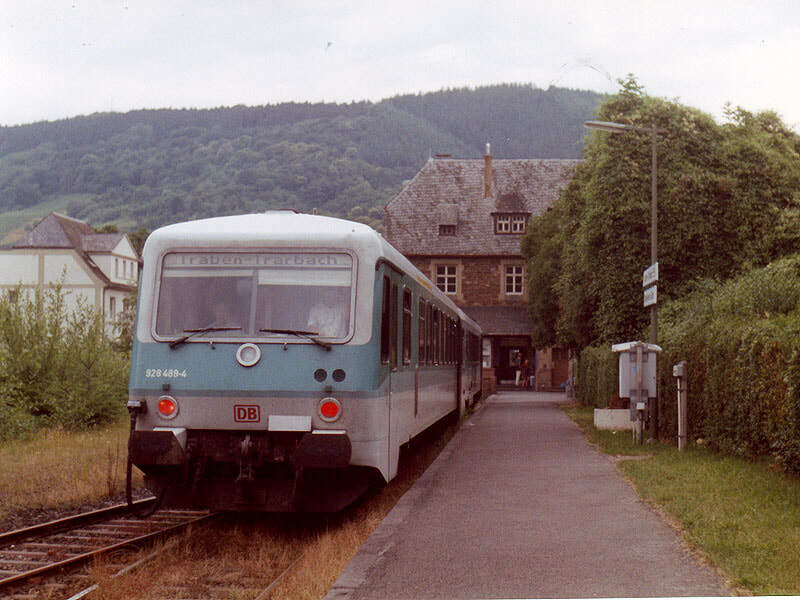 A nice little branch hemmed in by houses in places and with a small single platform terminus at T-T (presumably Traben is on the north bank and Trarbach on the south or vice versa). [This is indeed the case – Traben is on the north side, with a bridge between the two]. A 5 minute turnround gave time for 3 photos. Back to Koblenz on the next RE, allowing time for an odd Z on previously done track! At Koblenz the Hotel Continental Pfalzer Hof obliged with a very modestly priced room, and breakfast just early enough to catch EC51 at 0754. Koblenz Hbf had the only genuinely obnoxious, unhelpful and disinterested DB employee I’ve met, other than the attendant on the Schiphol-Berlin kipper a year or three ago, (q.v.). Supper taken, regrettably, at McDonalds as the local pubs didn’t look inviting enough to bother (‘sides, it was 2200). Koblenz Hbf totally redeemed by the most pleasant, affable and helpful DB man you could hope to find in a Reisezentrum! He was most anxious about the size and weight of the new Kursbuch, and wouldn’t I like a CD-ROM instead. I said I’d like one as well, but in the end they only had the floppy disk version. Excellent breakfast at the Continental, left the hotel at 0747, on P4 for 0750. The 0754 Praha was 1 minute late due to late running of preceding (Geneva) service. Further delay as we were diverted over the river, avoiding Mainz Hbf, and then back to the south bank of the Main at Mainz-Bischofsheim to gain access to the new (and very large) main line station at Frankfurt Airport. Arrival at F-Hbf was 29 late. This was translated to 31 late at Aschaffenburg due to signal checks and another single line stretch, making my 32 minute connection look dubious. I made it with ease in the end as it was delayed by 20 minutes waiting connections… At the time of writing the 8 minute connection at Gemünden doesn’t look good. And rightly so. The Wiesbaden-Bamberg RE, which I thought had gone, was running late and I watched it go from Aschaffenburg. Presumably it provided the connections which DB believed to be required at Gemünden. By the time my RB got there, still 16 late, the connection had gone. Grr. Making the best of it I got back on the RB and continued to Würzburg thus getting rid of a fairly irritating loose end, then decided to go back to Gemünden and continue on my way to Schweinfurt on the next service (1314). 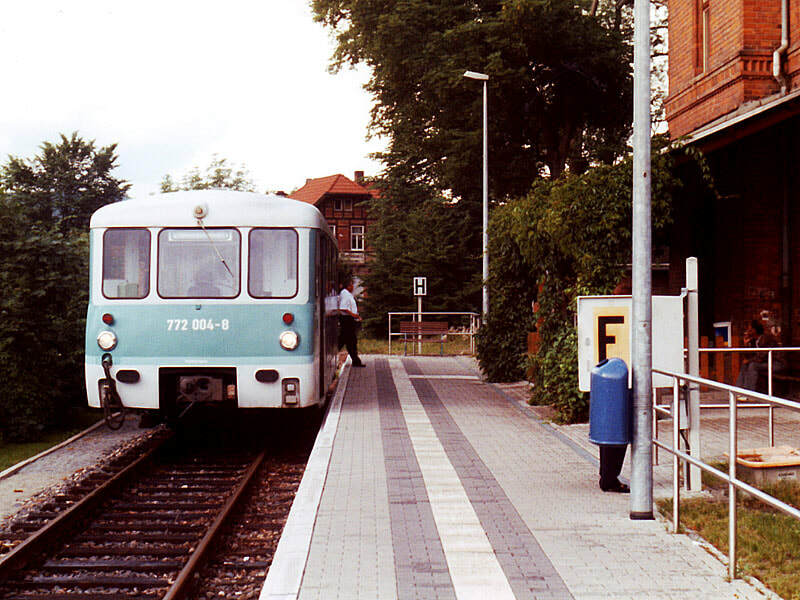 This was a 2-car push-pull set with a 212 at the front as far as Bad Kissingen. An excellent branch for the first two thirds, which climbs up quite a wide valley, never straight but not flange-squealingly tortuous either. A carnival was in progress at one of the villages with, seemingly, the whole population turned out. Time will tell whether the two phots of the marching bands are any good. After Bad Kissingen (once a through station) the line is fairly dull which at least prepares you for Schweinfurt. A desperate place seen from the station area, totally rebuilt à la Halberstadt (but much bigger). A 15 minute walk down to the town centre failed to reveal anything open, nor anything of interest to look at so being very hot by this time, I settled for a bus back to the station. [I don’t doubt Schweinfurt has many redeeming features, and I remember getting exactly the same impression of Skipton when I first went there. Not bombed and rebuilt admittedly, but it had the same depressing vistas from the station and the road into town, yet is actually a very nice little market town. I expect I’ll visit Schweinfurt again one day and get a much better impression!] 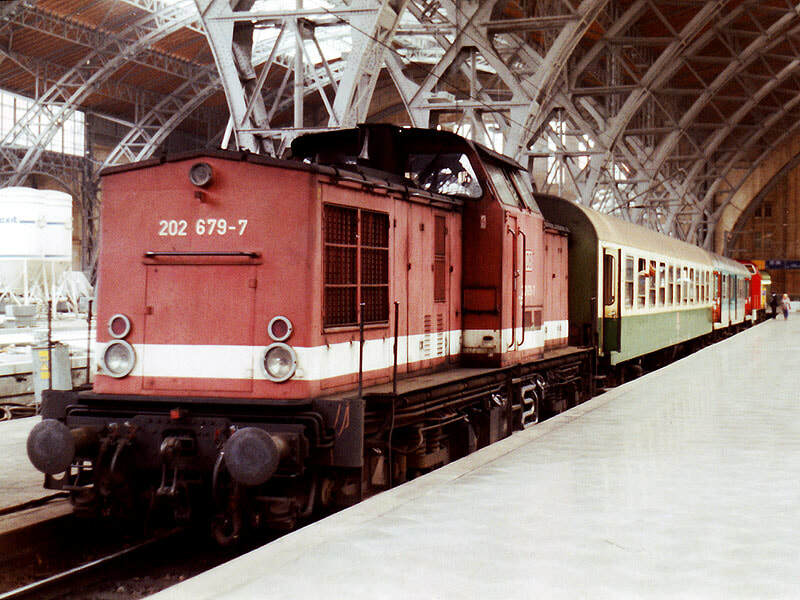 A 229 eventually appeared and provided transport to Erfurt via an exceptionally fine line over (or more accurately through in a tunnel) the Donau-Rhein watershed. At Erfurt the InterCity Hotel was advertising ‘rooms from DM111’. It seemed that cheaper establishments were not to be had nearby (must admit I only walked round the block – too hot!) so I enquired and was quoted 155. Expressing polite reluctance to pay such a sum I made to leave and was promptly offered 130. What about the 111? That was excluding breakfast apparently. I settled for the 130, amused by the tactics (again – see 3.4.99). Disaster at the off with the 0751 to Nordhausen, clearly shown in the new K-buch, non-existent. A hasty replan put me on 0745 IC to Weimar where the Kranichfeld branch proved very good value. It drops steeply away from the main line, through Weimar West, then climbs steeply through a half circle (ish) to reach Weimar Berkaer Bf, a small 2 platform terminus. This is modernised and I suspect shortened 50m or so but looks as if it was always a terminus (after reversal the line continues through Bad Berka, which ties in with the ‘Berkaer Bf’). Presumably when the line was built the engineering was too horrible to contemplate. The line continues in highly scenic style and made a very pleasant if unexpected trip. Returning to Weimar I caught ‘J.S.Bach’, 2 minutes late, to Leipzig where accommodation was quickly procured at the Ibis. It starts its summer rate today, amazingly. The pair of 202s top and tailing 1151 to Dresden was a surprise. All was revealed at Leisnig where we were directed on to a bus for Döbeln. Grr, etc., etc. 202 679 standing in for the (then) usual 232 on a Döbeln/Dresden train at Leipzig Hbf on 28.6.99. Moleworks meant that the service was spilt into two portions, Leipzig-Grossbothen and Döbeln-Dresden, with buses between. The expected 232 and four coaches were waiting at Döbeln, leaving 28 minutes late (through no fault of the bus driver who clearly knew no fear!). The track is noticeably poor on this stretch and I suspect the line was well worth doing even with a bit missing. There was a 204 with a train of tanks at Rosswein, at least one of which was Polish, so freight might keep the line alive, or not. A pair of 232s, or 4s, were top and tailing a train of tanks on the Nossen-Riesa line which was a bit of a surprise. The funereal pace continued past the end of the S-Bahn service at Meissen, until we were near Dresden. On the curve into Dresden Hbf, 36+ minutes late at 1501, I observed the 1500 S-Bahn to Schöna approaching from Neustadt. Amazingly, nay unbelievably, it stopped, held at a signal while we crossed in front of it. A charge down the stairs and up to the next platform was enough to make the connection. This miracle achieved, I settled down to while away the 18 minutes to Heidenau. Rather than unpack the K-Buch again I picked up a timetable leaflet from the rack – it informed me that the ‘service’ to Altenberg was a bus. I enquired of the gripper (first time ever on a Dresden S-bahn) – no, he said, it’s a zug. I stayed on until Heidenau. No sign of any trains there – went outside – found a bus labelled DB Altenberg. I asked the DB man. Yes, he said, it’s a bus. Not a train. Evidence seemed overwhelming so I retired to the platform for some serious teddy throwing and spotted a local notice advertising bustitution 30.5.99-31.8.99. Why not put it in the Kursbuch? Back at Dresden Hbf the best bet seemed to be 1618 IC to Köln as far as Leipzig with a view to an earlier trip to Narsdorf and back (following up the observation made on Easter Monday, 5.4.99). 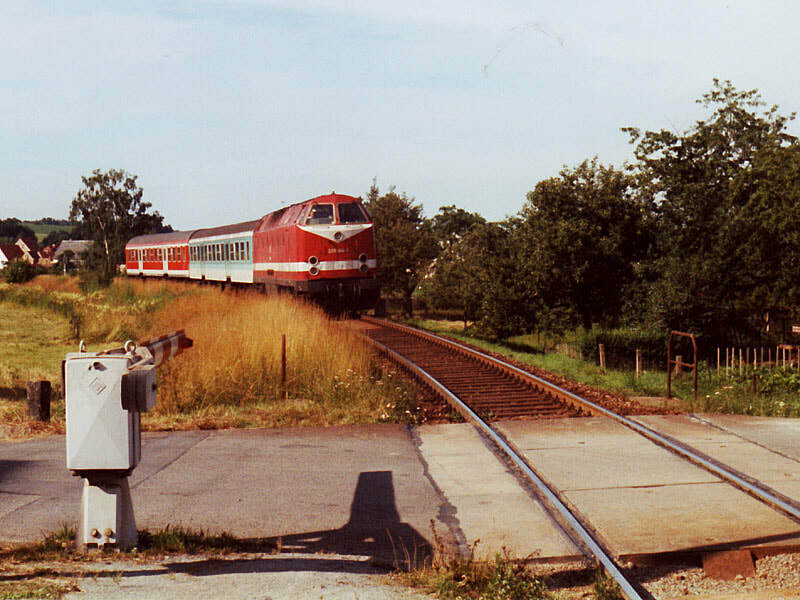 The IC left on time (and from Neustadt) but by all manner of mimsing about it was 6 late at Riesa and after a sprint through Oschatz it slowed down again and was 3 or 4 late at Leipzig thus affording me a grandstand view of the 1738 to Chemnitz on its way out. I had positioned myself in coach 6 so as to be by the subway at Leipzig for a mad dash for the 1 minute connection, but it was not to be. Well, what else would you expect today. A fuel and water opportunity was made from the 40 minutes wait for the 1824 to Narsdorf via Borna, which was 219 propelled and late. The parish notices for the Döbeln diversion were observed – I had time to read them this morning and should have done so. It continues until late July. Lateness was up to 21 by Markkleeberg due to a TSR but with the help of a 5 minute booked stop at Borna which wasn’t taken, down to about 13 by Narsdorf so all well so far. There isn’t a pub at Narsdorf anyway. If there is ever a need to go back there, note that the xx51s to Chemnitz use the other side of the station. Back to Leipzig on the 1950, 219 hauled again and 5 or so late. Not too bad a day in the end after so many little problems but it will be annoying having to go back to Dresden yet again [2018 - how many times have I been back to Dresden now?] Best done en route to Czech perhaps, there being plenty of unfinished business around Děčín. Rather than push my luck with a late outing, an earlyish night was declared. The occupant of the room above (who seemed to have stiletto heels) rose at 0500 and clicked around for quite some time. Thus woken, I went for breakfast at 0630, opting for the earlier 0705 to Altenburg (original plan 0723) to give me time to read the parish notices at Altenburg. Good move as it turned out – the notices revealed bustitutions over the south to east curve, but this time not affecting my planned trains. 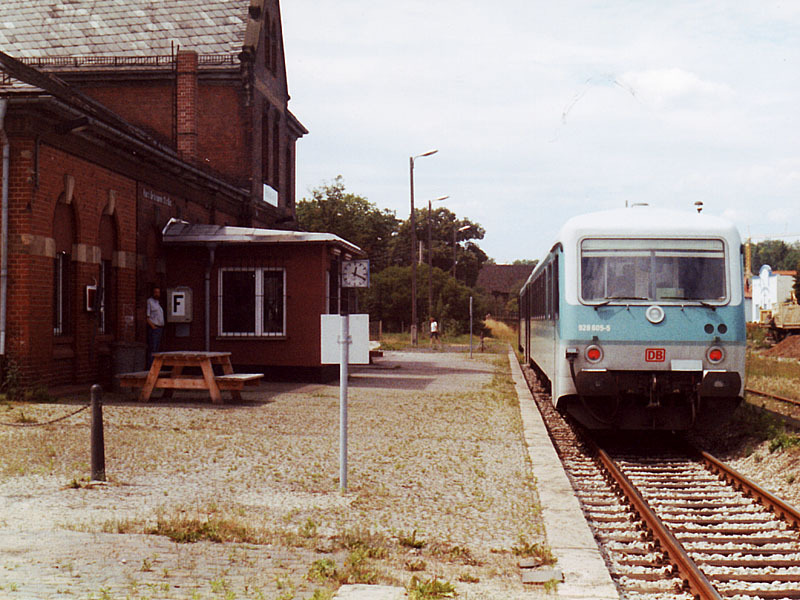 There followed a highly satisfactory triangle bash, starting from the isolated P4 at the south end of Altenburg station. Haulage was a 219 to Großstöbnitz which is a single line station a mile or so west of the triangle. No problem. It was a very pleasant spot to while away what was supposed to be about 15 minutes. After a slight recovery lateness set in again but I had by now realized that an extra 6 minutes could be had by changing at Gera Süd so this was done. G.S. has a fine collection of weeds but not much else. The junction with the line to Triptis is not until Weida, so no overlap problem. A very pleasant trundle to Saalfeld, 219 again. No TSRs that I noticed and - wow – arrival at Saalfeld was on time at 1107. ‘Faced’, as they say in the Sun, with a 30 minute connection I repaired to the Black Cat nearby where Tucher Pils from Nürnberg was to be had. Very nice it was too, and at 3.20 for 0.4l (about £1.60/pint). Very affable staff, pleasantly appointed, does food, opens at 10. Remember for next visit! For future reference: no problem with the junction at Rudolstadt-Schwarza. At Orlamünde I embarrassed myself slightly by getting out on the side of the train nearest to the Pößneck train. The arrangement is one of those track 1, platform 1, track 2, platform 2, where you’re supposed to get out of a train on track 2 at platform 2. Still, the door opened and nobody minded. I was the only passenger to Pößneck unter Bf and the conductor asked if I was sure. No wonder it’s been on the hit list. Track seems quite good though so maybe it’ll last for a while. Slightly early arrival at Pößneck u. Bf., which is a harmless little one platform station at the end of a harmless little branch (and was ever thus – one platform, run round loop, one siding and a goods shed on the end of the run round loop). Back at Orlamünde the junction is half way down a wired loop so I guess we can count that one! 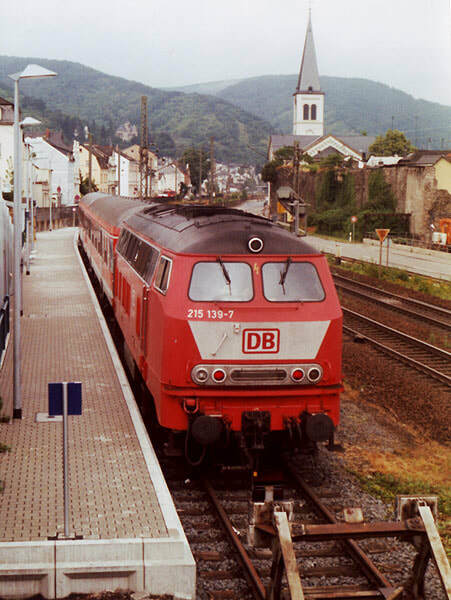 215 139 at Boppard Süd prior to working up the hill to Emmelshausen on 30.6.99. The Boppard Süd 'branch' is effectively just a siding parallel to the Rhein valley main line on the right. The RE to Würzburg (worked through to Wiesbaden) was a brand new air conditioned set of the type I watched go from Aschaffenburg on Sunday. Very comfortable too, though as usual there was insufficient ‘insulation’ from the smoking section. At Würzburg the IC to Koblenz was more or less on time and had an uneventful trip apart from (I think) a minor diversion on to parallel non-IC platforms at Hanau and a short wrong line stretch near Mainz. It was packed after Frankfurt. Also notedL Mainz Hbf seems to have lost its roof. The Hotel Höhenstaufen at Koblenz had my reservation, despite the apparent incompetence of the Sunday night clerk, and provided me with a splendid corner room almost large enough to be a suite. 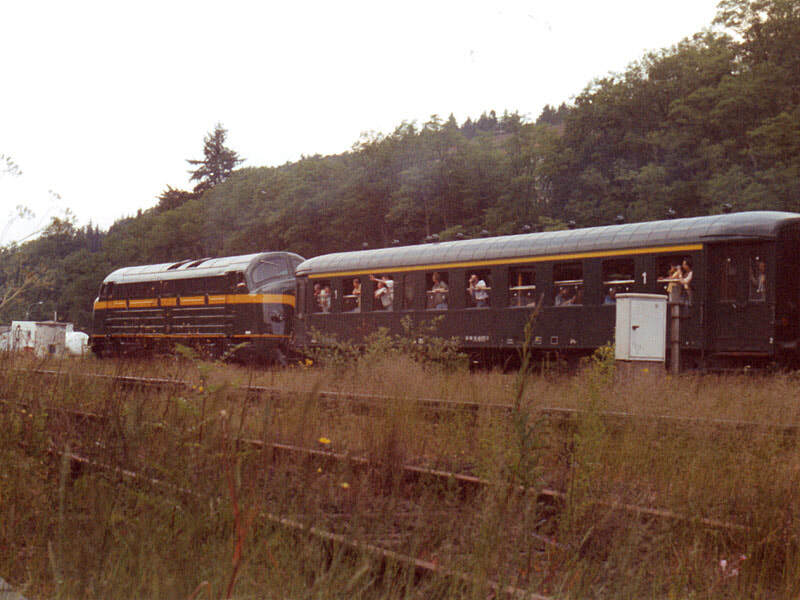 I went down to Boppard on the 1958 intending to do the last service to Emmelshausen and back, which works through to Koblenz. It was bustituted so I walked down to find Boppard Süd which turned out to be a siding on a parallel alignment to the main line. Track if you’ve done it. When I returned two poorly 215s had appeared with the branch trains and there was much shaking of heads over them. Another one, apparently unrelated, appeared from Koblenz, at which point your reporter hadto leave on the 2048. Conclusions: Boppard Süd only worth doing if you’ve nothing better. Emmelshausen looks excellent with fearsome climb out of Boppard. Physical connection not really worth bothering because it’s done by other trains e.g. 1812 to Trier. The climb to Buchholz is hair raising and immediately reminds you of a railway version of the Burway at Church Stretton. There are several tunnels and two quite serious viaducts on this stretch. The top part of the line is more conventional and the scenery opens out more. At Buchholz an out of use line joins on the north side. The line appears to continue beyond Emmelshausen (bar appeared open, no time or inclination to confirm). [The line did continue beyond Emmelshausen at one time, to Simmern. I don’t know what the o.o.u. line at Buchholz was, though suspect it was a factory siding.] The return journey is brakes on all the way down from Buchholz of course, and a cynic might wonder if Boppard Süd is there as an overrun for the incautious! The local from Mainz provided transport back to Koblenz at 1043, arriving in good time for the 1112 IC. At the time of writing this is 5 late for a 12 minute connection at Hagen. Dèja vu. As it turned out, 5 late was down to 1 late by Bonn and on time at Köln. Thereafter time was kept with about 2 minutes early at Hagen. How nice to see DB back to its best. More minor wobbles then though, as the 1312 to Essen lost 5 minutes or so but it arrived in adequate time for the 1416 S-Bahn to Düsseldorf Flughafen. The new main line station is now appearing (platforms at least) with some kind of people mover being built to link it to the terminal. This should be a major improvement for the likes of me but is probably over a year away. Just to show that the UK can keep up with the rest of Europe, BA was 40 minutes late because (we were told in flight) the cabin partition hadn’t been secured properly at BHX and the aircraft had had to turn back. Eventual arrival at BHX Eurohub was 1743 – thanks to having the rucksack allowed as cabin baggage I made the 1756 Silverlink to New Street and 1810 Central Trains 323 onwards to Wolverhampton, finishing up on 1837 all stations to Telford. Only a month was to elapse this time - more ex-DR lines on the agenda, with a tour allegedly doing the closed section from Loburg to Altengrabow. I tried a new tactic and set off on an evening flight to Düsseldorf.